Axact - Responsive Magazine Blogger Theme ~ Themeforest | Axact v3.1 – Responsive Magazine Blogger Theme (Updated on 5th July 2017) is an elegant, ultra modern, clean, fully responsive and awesome flat Blogger template that is perfectly suitable for news, magazine, sports, tech, games and other type of multipurpose blog. 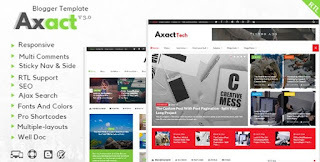 Axact Blogspot Template is proudly designed with flexible approach which lets you to easily change the entire color, font size and other easiest customization that you can made through professional blogger template designer. -Fixed image thumbnail not appearing due to apostrophe in title. Terima Kasih Sudah Membaca Artikel Axact - Responsive Magazine Blogger Theme. Jangan Lupa Bagikan Jika Bermanfaat. :).